The chefs at Montreal’s Joe Beef, Frédéric Morin and David McMillan, don’t play around when it comes to decadence. Case in point: the double-down. The chefs at Montreal’s Joe Beef, Frédéric Morin and David McMillan, don’t play around when it comes to decadence. 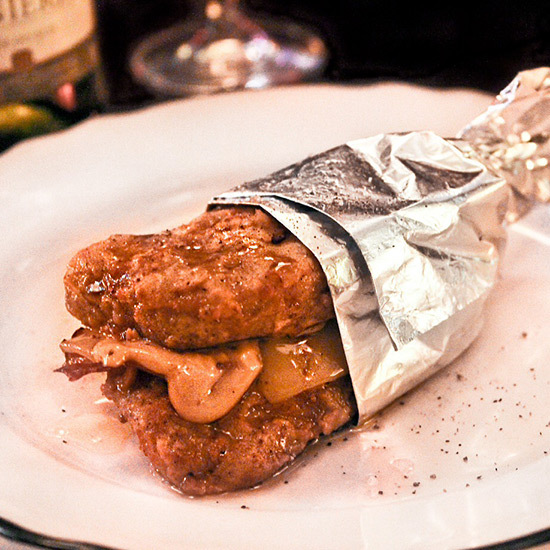 Their famous double-down is a sandwich made with two pieces of deep-fried foie gras (which act as the bread), filled with bacon and cheddar, then drizzled with maple syrup. “We first did it as a joke,” Says McMillan. “We were laughing at food media one day and decided to come up with the perfect lure. We started sending them out whenever a blogger came in. As we predicted, the dish took off on social media and turned into our little nightmare, and now we’re trapped into making it. I would never eat it. I think it’s disgusting.” Instead, McMillan prefers the restaurant’s pork schnitzel with a sunny-side egg, a fillet of anchovy, a slice of tomato and béarnaise sauce. “That’s delicious,” he says.